Real Food Daily: Goodbye, Boring Breakfast! One of my favorite breakfast meals is crust-less quiche. Prepare a large pan on Sunday afternoon and you’ll have breakfast covered for the next week. Trust me; you will not miss the crust! 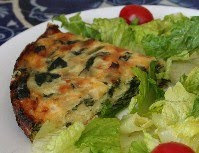 The following recipe is one of my favorite concoctions (spinach and mushroom quiche) The best part is that you can have fun with it; keep the basics (eggs, milk, salt and pepper) and then throw in left-over’s from last night’s dinner to create your own quiche—be creative and have fun! 2. In a large frying pan, sauté onion and garlic in olive oil until tender, next add butter and mushrooms (continue to sauté until mushrooms are tender.) Remove from heat. 3. In a separate bowl, beat the eggs. Add the cheese, salt and the pepper, and stir to combine. 4. Add spinach, mushrooms, onions and garlic, stir to combine. 5. Pour into a greased 9 x 13 glass baking dish; bake for 30 minutes, or until the edges start to brown. Lose Weight; Eat Real Food!